Watching Jamie Oliver’s Great Escapes in Athens, Greece, he cooked up some brilliant lamb kofta kebabs. They looked the business for sure so I decided to do a bit of Greek style grilling myself with some couscous a Greek salad, hummus, tzatziki and pita bread to accompany the kebabs. Man, just thinking about this makes me hungry. Anyway we are crammed here in Berlin with Turkish grocery stores so I made a bee-line to Bolu and checked out what they had for meat. Naturally lamb was the choice but I didn’t feel like mincing it myself, so I bought a mix of lamb and beef. They had lamb already seasoned for kofta but I always prefer to mix these things myself as you never what going on in there! 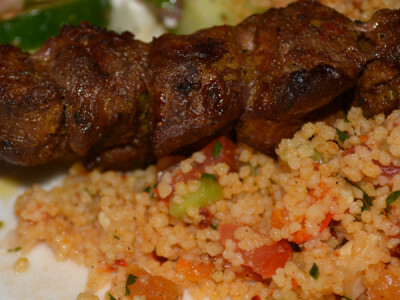 If you’ve had an authentic kebab you will know how delicious they can be, with nuts, spices, herbs and fruit, yes fruit. In this recipe for Lamb Kofta Kebabs, I some sumac which is a spice often used in Turkish cooking– it has a lovely fruity flavour but if you can’t find it, use some lemon zest instead. I also use Ras el Hanout which is typical of North African cuisine and Harissa which is a blend of peppers, dried red chillies, garlic, caraway seeds etc and gives the meat a nice exotic middle eastern flavour and great mixed in your lamb kofta kebabs. to prepare the lamb kofta kebabs, place the minced lamb in a bowl and mix with the coriander, harissa, ras el hanout, cumin and sumac also season with salt and pepper and add the pistachios. Mix well and then divide the meat into six equal balls. Get six skewers. You can use the metal ones as they heat up and help cook the kofta from the inside or use the flat wooden ones, these I find are easier to keep flat on the grill without the meat rolling around. With damp hands, shape the meat around and along each skewer flattening it and then press little indents in the meat with your fingers as you go – then place on a hot grill. I always serve these with couscous and some salad with pita bread. Always nice with some yogurt drizzled over the top or some tzatziki.